Heat the oven to 375º F. Line an 8x8 inch baking pan with parchment paper. Cream together the softened butter and sugar in electric mixer with paddle attachment. Once a creamy consistency, mix in the cornstarch, salt and flour (do not over mix). 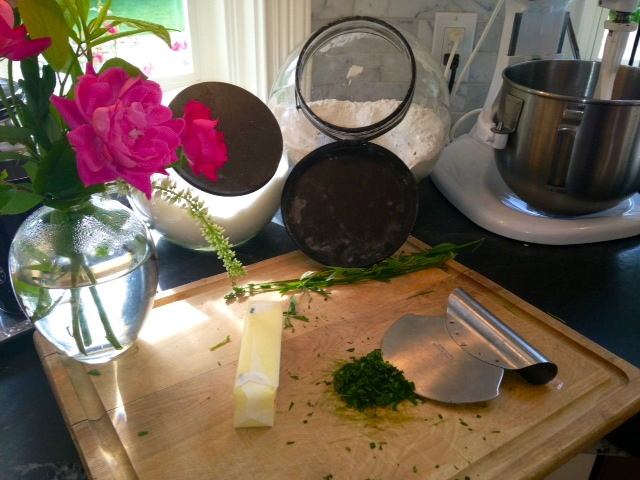 Lastly, add the Lavender and mix just until ingredients begin forming clumps of dough. On a floured surface, knead the dough 10 times and roll out to an 8x8 inch square. The dough will be about 1/2 inch thick. Using a metal spatula and your hands, carefully lift the dough and place it in an 8x8 inch glass baking pan lined with parchment paper. (if you want thinner shortbread you can cut the dough in half and make two 8x8 inch pans that are 1/4 inch thick). To prevent the dough from bubbling, make holes with a knife or fork all over the surface of the bread dough. Dust with 1Tbsp. of sugar then place it in the oven. Bake for 17 minutes (if using one 8x8 pan; if using two pans to make thinner shortbread, bake for 15 minutes). After baking for 17 minters, open oven door and knock the pan against the side of the oven to relieve any spots that may be inflated. Continue baking 15 more minutes, until edges are beginning to brown. (In my opinion the more done the tastier!) Immediately dust with the remaining 2Tbsp. of sugar and let cool. Using a sharp knife (not serrated!) cut the shortbread into whatever shape you want! I made long skinny rows, as you can see in the picture at the top. **(Another option is to dip the entire 8x8 square in chocolate ganache and letting it dry before cutting the shortbread into pieces. This will require a double recipe of the ganache, as you will need to fill the bottom of a 9x13 pan with chocolate (or something the shortbread slab will fit into easily). Place chocolate in a heatproof bowl. Heat cream in a saucepan until edges boil (small boil, not large bubbles), stirring constantly. Remove from heat and pour over chocolate. Let stand for 3 minutes, then stir until smooth liquid consistency. 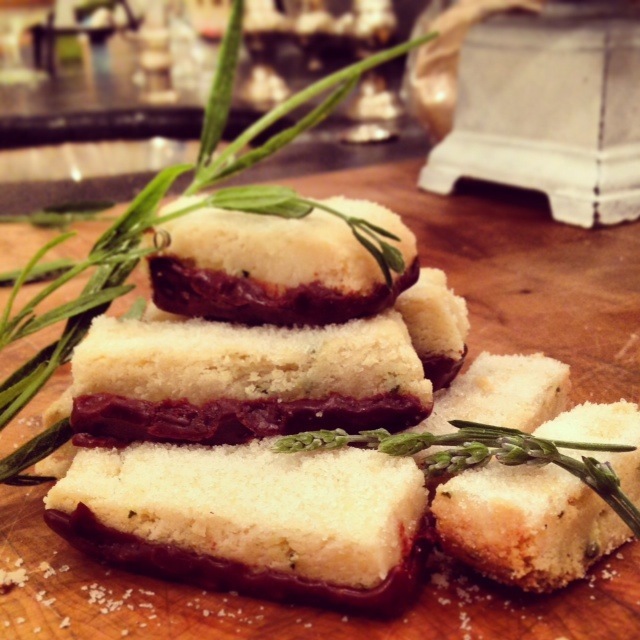 Submerge cooled shortbread pieces in the Chocolate Ganache until the sides are halfway covered in chocolate. Place on parchment paper, chocolate side up, to cool. … then try not to eat every single one of them. I failed at this part!